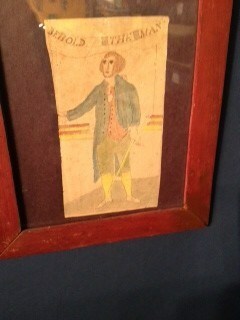 “Behold The Man,” that’s the phrase on this American folk art watercolor I discovered today at the Maryland Antiques Show. 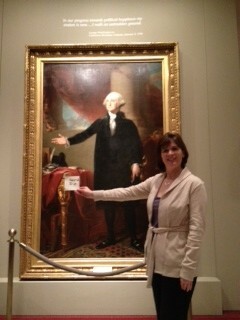 The painting shows George Washington with his arm extended in the style of the famous Gilbert Stuart painting. My friend Jamie invited me to attend the event, benefitting the Auxiliary for Family and Children’s Services of Central Maryland, which raises money for local non-profit organizations. Jamie will be in charge of the event next year and has been saying for a while that I should get involved. “There are nerdy things in there,” she promised. And she was right! There are lots of things you can discover at an antique show. Here’s what I learned: apparently “Behold The Man” is a common Washington image in American art. A quick Internet search shows that the phrase, often appearing with a longer title, “The Effect of Principle, Behold the Man,” is frequently associated with items, such as textiles and engravings, commemorating the 1796 speech Washington made on his resignation from public life. The phrase is sometimes seen along with a quote from Washington’s eulogy. I am not a Washington scholar, so if someone has more insight into this, please let me know. 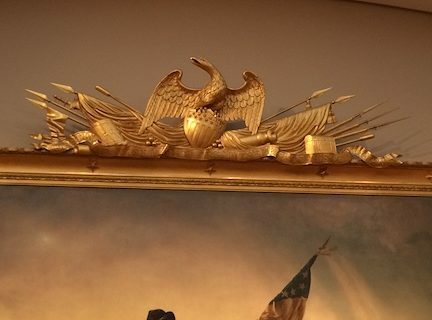 Another online site says that there is a legend that the phrase “The Effect of Principle, Behold the Man” can be found inscribed above a full length picture of Washington. 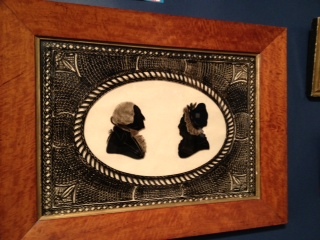 Bev also showed me a reverse painted glass piece featuring George and Martha Washington (image below). It’s really cool.